In the past, people would buy a home and live there for the rest of their lives, often passing it on to their family. Things have changed. Many first-time home buyers are going into it with the attitude that they’ll sell when it’s time for a change. If you’re looking to sell your house, you could be frustrated. Despite the market trends in Fort Worth slowly shifting, it’s still very much a buyer’s market. With so much property available, you could find yourself waiting months or longer to get a fair price on your home. One option that many homeowners are turning to is selling to a real estate investor like Fort Home Buyers to buy your house from you. These independent investors typically purchase homes, repair them, and then use them to generate income; either as rental units or sell them for a profit. Fort Worth has numerous reputable and trusted real estate investors who will help you sell your home quickly. So, selling your house to an investor might not be as futile as it seems, after all they repair your house and give you cash offer for a house that is practically impossible to sell. You do not need to repair it your self, sell it as-is and still you got the money you need. The investor will then inspect the home and determine a fair value, taking into account necessary repairs, and make an offer. If the offer works for you, you’ll close, and receive the payment for your house in cash… usually within 7 days if you want to close that fast. How you can benefit on this transaction is pretty simple indeed. All the hassle on your side is being taken care of for you. Most of the time when a homeowner want to sell their house they often spend a significant amount for the inspections, all the repairs and parts that needs to be replaced, not to mention that those parts might be expensive, asking a help to a realtor means you will have to pay for commissions, in order for your house to sell and not wait for a long period of time. There are effective ways on how to sell your house without a realtor, its way cheaper for your side and still guarantees sale as if you had a realtor. In this competitive market selling your house can take a very long time if not months it could take at least a year, might think it’s probably not a year but most of the houses sell around 3-5 months not to mention your house might not be as good looking as the other on the market. Pricing also matters, most people price their houses a lot larger than it is because they are emotionally attached to it. Now, going back to selling your house to an investor, you might have a house that you want to get rid of, or its too damaged to be sold, or you inherited a house and don’t know what to do about it – in these situations, investor can greatly help with these situation. How you can sell your house is totally up to you, for example if you are under foreclosure and for you the best option is maybe to put your house on sale, investors can also help you with that. Selling your house to an investor is the best option if you want fast cash and you don’t want to spend money unnecessarily. 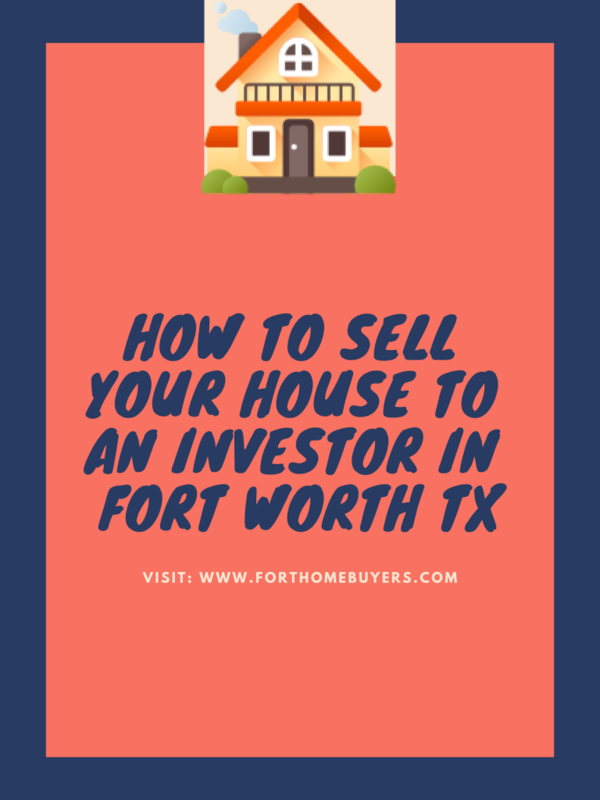 If you need to sell your Fort Worth home very quickly, with little hassle, selling to a Fort Worth real estate investor is a great option. Once you have agreed to the price of the house, it totally goes down to you on when you will choose to close. When you work with a real estate investor… there usually aren’t any fees involved, as you don’t have to worry about paying an agent commission, and most often, the investor will cover the closing costs. The investor will take care of it for you. Easy and fast! While real estate investors are often looking to purchase homes at a discount, allowing them to fix up the house if it needs repairs… then sell the home to another home owner. And that is how to sell your house fast and easy. Extra months of mortgage payments, utilities, maintenance costs, and other fees could quickly add up. By selling at a slight discount, you could potentially end up with a larger sum in the long run. You would not want to be in that scenario that when you sell your house you wont have an R.O.I or return of investment. Fill out the form below to get a fast cash offer on your home! Here is a blog on how to get your house ready to sell.